Considering renewables? Local people from across the Vale of Pewsey, who have already taken that leap, are opening their doors to chat to you about their experiences. 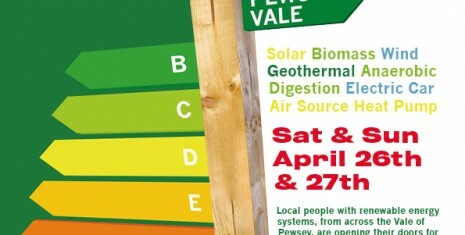 See the technologies in action and chat to the renewable energy pioneers of the Pewsey Vale! Pewsey Vale - Green Open Homes event aims to encourage local people to find out more about the renewable energy options available to them and provide them with the opportunity to chat to home and business owners about the advantages of installing low carbon technologies and discuss any challenges that they might need to consider before proceeding. Technologies include - Solar, Solar thermal, Wind, Biomass, Heat pump, Anaerobic Digester (Open Farm Sunday) and even an electric car! Properties in Pewsey village and in the surrounding parishes.